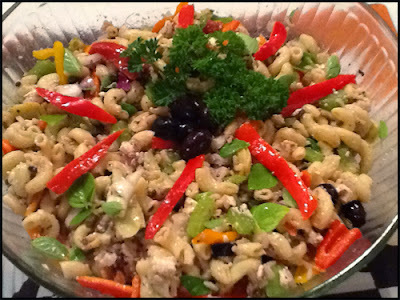 Cool refreshing salad, great for summer picnics or porch parties. I typically use a jar of Greek “Steve’s Gourmet Olives” for this salad since they do not have pits inside. Either mild or spicy, according to my mood. Throw leftover chicken or pork on top for filling dinner salad. Salad even better on Day 2 or 3. Cook and rinse pasta. In large bowl, combine all ingredients. Mix well. Refrigerate, preferably overnight. Garnish with fresh basil or parsley. Serves 10-12.